Another week of falling behind on all the posts I’d planned on writing… I blame the sunshine. When the warm weather comes, I can’t help making the most of it! And since I’ve got a couple of book reviews to finish, I’ve had the perfect excuse to sit back and enjoy the sunshine. Since last week I’ve had a lot of lovely messages about my last post and I just wanted to say thanks! One of my favourite parts of blogging is getting to chat to like-minded people. It’s great to hear from other bloggers who have experienced the same things – and sometimes it’s much easier to explain your blog related concerns to other bloggers. This week I’ve been getting wound up by one of the interns and a designer at work about my blogging- I didn’t realise how much of a pattern the titles of my posts fall into, but they were kind enough to point it out! I guess I just like lists because they’re a bit more descriptive. Speaking of becoming repetitive, I’m thinking that gingham may be my favourite summer fabric. I’m definitely the sort of person who falls into the trap of buying similar clothing all the time – but then I know what I like and what suits me! What it does mean though, is that I end up with lots of very samey looking outfits. I’ve had a long term obsession with breton tops that my mam likes to tease me about but this summer, I seem to have become obsessed with gingham. And as the guys I work with have so kindly pointed out, making myself look like a picnic blanket. 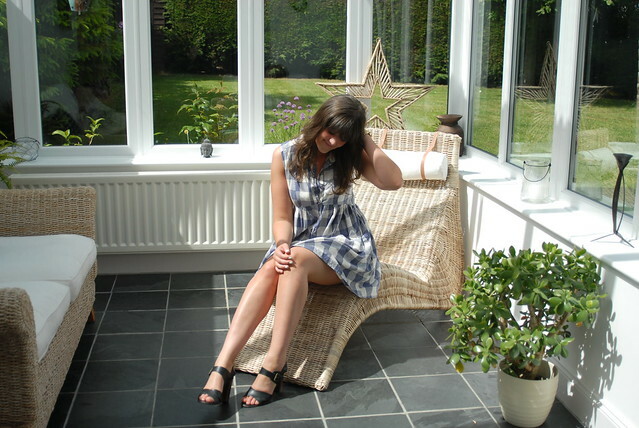 This dress is from Topshop a couple years ago, but it’s actually a charity shop find! Being a smock shape there’s a lot of fabric in it but it’s nice and light, so perfect for all the sunshine we’ve been getting! These sandals are also an old Topshop find that I’ve recently become obsessed with.. they’re just the right height to dress up a day time outfit, or for a night out where you don’t want to cripple yourself in platforms. I can't lie – I do adore a bit of gingham! Think it goes back to the days when I loved Pollyanna/Anne of Green Gables.